This is the second set of Russian infantry made by Strelets for the Crimean war, which demonstrates their remarkable commitment to produce a comprehensive range of figures for this campaign. Their first set depicted the infantry in their greatcoats, which was the most common form of dress during this war, regardless of the season. This set concentrates on the summer uniform, and while less common this still appeared in the war and was often worn at the same time as others chose to wear the greatcoat, so mixed units are perfectly possible. The summer uniform was a single-breasted coatee with short tails over trousers, and has been correctly done here. All the men are wearing a full pack including a sabre, which would not always have been worn in actual combat, and in any case has been incorrectly done with straps passing over the shoulders when packs were actually held by a second set of cross-belts. About half are wearing the tall helmet while the rest have chosen the more comfortable forage cap - a reasonable split, although it is unclear how often the helmet was actually worn in the field. Naturally all have the cartridge pouch, which has the grenadier three-flame badge on it; the only distinction making these grenadiers at this scale. The officers wear the peaked cap and jacket, but we would have expected to see them wearing gorgets as they are on active service. With this set Strelets have delivered a less expansive range of poses than normal. The box tells us that three quarters of the figures are intended for an attacking column and the rest are for the firing line, and sure enough most of the figures are either advancing at the point of the bayonet or firing. Each pose is still different, but not by a great deal, so a very realistic firing line or advancing column can be put together without the perfect cloning appearance that comes from the same pose repeated many times. The Strelets sculpting style in repeated here, but this is not one of their best efforts. Detail is reasonable but a little chunky, and some of the anatomy is really very poor - several advancing poses have completely straight legs and look very unnatural. Happily there is no flash and nothing needs to be assembled, so for example the drummer comes complete with his drum, which is however embedded deep into his leg. Russian flags of the period were 142cm square, but this one is only 1 metre high, though almost wide enough. As a result the staff is not nearly long enough, causing problems for anyone wanting to replace the supplied plastic with a better paper flag. Happily however there is no engraved design on the flag. This set is a good match for the first Russian infantry set and allows much more variety in those infantry battalions, but some highly unnatural stances and a generally very rough style of sculpting, plus a handful of accuracy errors, means it can't be said to take the breath away. 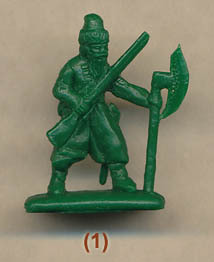 Note The final figure is of a soldier from the Streltsi of 17th century Russia. Though he is unrelated to the subject of this set he is one of a series of 'bonus' figures which when combined will create a set of this unit for the Great Northern War. See Streltsi Bonus Figures feature for details.